We’d love your help. Let us know what’s wrong with this preview of Kissing Carly by Deanna Lynn Sletten. Carly Stevens loves to have fun but her carefree lifestyle has finally caught up with her. Broke and in debt, she heads to Montana to spend the summer with her sister, Andi Brennan, at the Brennan ranch. Her sister agrees she can stay on two conditions—she works to pay down her debt and changes her wild-girl ways. Reluctantl Now available! Carly Stevens loves to have fun but her carefree lifestyle has finally caught up with her. Broke and in debt, she heads to Montana to spend the summer with her sister, Andi Brennan, at the Brennan ranch. Her sister agrees she can stay on two conditions—she works to pay down her debt and changes her wild-girl ways. Reluctantly, Carly agrees, but it isn’t long before she breaks her promise and finds herself in a bind and Randy comes to her rescue. Carly begins to see the ‘crusty old cowboy’ in a different light and soon finds herself falling for the one man she’d never thought it was possible to fall in love with. To ask other readers questions about Kissing Carly, please sign up. I love that I got to take a trip back the Brennan ranch and was able to see all those people I had come to know and love in the first two books of this series. That place and the people who live there are so comfortable, kind, and warm that I just want to stay there. I love this family so much! Kissing Carly, book #3 focuses on Carly, the wild one in the other two books. She runs into trouble in the big city and heads to the ranch to regroup and to try to figure out what is important in life. Oka I love that I got to take a trip back the Brennan ranch and was able to see all those people I had come to know and love in the first two books of this series. That place and the people who live there are so comfortable, kind, and warm that I just want to stay there. I love this family so much! Kissing Carly, book #3 focuses on Carly, the wild one in the other two books. She runs into trouble in the big city and heads to the ranch to regroup and to try to figure out what is important in life. Okay, so we kind of know from the start that she and Randy are going to try to hook up but they both have a lot to work through and get past. Watching that happen is what made me want to keep reading. Randy has Carly figured out from the first moment he laid eyes on her. He sees right through her and is the one male who doesn't fall for her games. Carly and Randy have both had rough lives and those experiences have shaped who they are perceived to be today. But is that facade their real personality? Can they let their guard down and become vulnerable and able to love and be loved? Carly has a lot of growing up to do. Living in her paid for townhouse and not having much responsibility other than a job lets her go out and party with her friends on a nightly basis. However, partying all the time has it's consequences and for Carly, the consequence of losing her job has her crawling to the Brennan ranch to find her sister Andi. Andi and the rest of the Brennan crew are taken back to see Carly just show up at the ranch. Andi has agreed to help her figure out her bills and stra Carly has a lot of growing up to do. Living in her paid for townhouse and not having much responsibility other than a job lets her go out and party with her friends on a nightly basis. However, partying all the time has it's consequences and for Carly, the consequence of losing her job has her crawling to the Brennan ranch to find her sister Andi. Andi and the rest of the Brennan crew are taken back to see Carly just show up at the ranch. Andi has agreed to help her figure out her bills and straighten out her life but she needs to quite the partying and get a job. Everyone at the ranch is very welcoming and eager to help Carly except for Randy. Randy has always seen Carly as the spoiled brat and wants nothing to do with her. He does his best to ignore her and he does a pretty good job of it until he is out to prove something and kisses her! Randy had a hard childhood. Never having parents around to raise him, teach him or love him made it rough. With the Brennans behind him, he turned into an amazing cowboy. Seeing Carly grow up and make her job into something she loves was amazing. I loved the little store she worked at and loved what she made of it. Randy and Carly make the cutest couple! I loved this series so much! Carly is a self centered, spoilt, brat! When her life is turned upside down.. She heads to the Brennan ranch to stay with her sister. There's just one problem, Randy the ranch hand hates her. , but the feeling is mutual.. He thinks she's a spoilt princess and she thinks hes a moody old cowboy! But the more time they spend with each other, the more their feelings for each other change... I'm so sad that this series is over, I might go sulk lol!! 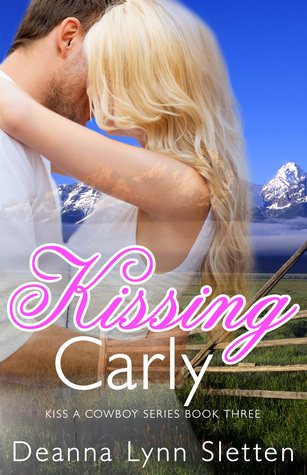 Kissing Carly was the best of the three Kiss a Cowboy Series. I loved Randy and I thought Carly evolved nicely throughout. While I had some issues with book one, fewer with book two this was much better. There were no obvious inconsistencies that I noticed as there were in the two previous books. Although I did see some incorrect word usages that distracted me. On the whole, I enjoyed all three in the series but the last was the best. This book was as great as the first two in the series.... The author made the books flow seamlessly from the first to the last of the series and each book romance was so different. I love anything with cowboys and the mountains of the Rockies.....loved it and the "friends" I made while reading the series. It can be a stand alone book but reading the series in order was so much better!! I couldn't get past page 24. The whiny, spoiled, bimbo of the main character, Carly, was too much to stomach. This is another really good book about cowboys and life on a ranch . All the love that is shown between everyone. Deanna Lynn Sletten is the author of MAGGIE'S TURN, FINDING LIBBIE, ONE WRONG TURN, MISS ETTA, and several other titles. She writes heartwarming women's fiction and romance novels with unforgettable characters. She has also written one middle-grade novel that takes you on the adventure of a lifetime. Deanna believes in fate, destiny, love at first sight, soul mates, second chances, and happily eve Deanna Lynn Sletten is the author of MAGGIE'S TURN, FINDING LIBBIE, ONE WRONG TURN, MISS ETTA, and several other titles. She writes heartwarming women's fiction and romance novels with unforgettable characters. She has also written one middle-grade novel that takes you on the adventure of a lifetime. Deanna believes in fate, destiny, love at first sight, soul mates, second chances, and happily ever after, and her novels reflect that. Deanna is married and has two grown children. When not writing, she enjoys walking the wooded trails around her home with her beautiful Australian Shepherd or relaxing on the lake in the summer.